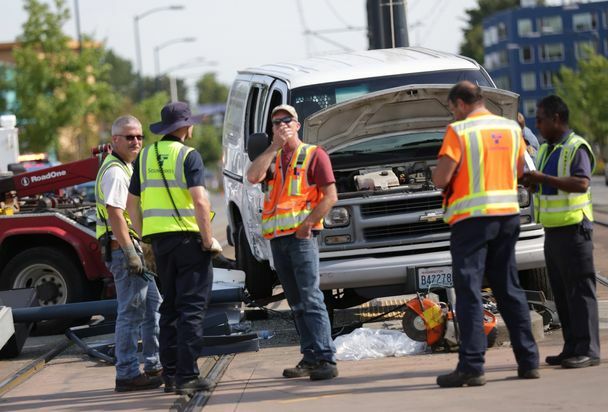 Authorities say that a collision between a light-rail train and a van in Seattle’s Rainier Valley neighborhood last Friday occurred after the van made an illegal turn in front of the train. The crash left five people hurt, though they were reportedly in stable condition and expected to recover from their injuries. The light-rail train was heading south toward Tukwila, according to Sound Transit spokesman Bruce Gray, and was mostly full at the time of the collision. Gray added that as the train was in motion, a van that was heading north on Martin Luther King Jr. Way South made an illegal turn in front of the train. The train operator reportedly attempted to use the emergency brake once he saw the van make the turn, but was ultimately unable to avoid the collision. The train sustained enough physical damage that it actually had to be towed away from the scene. According to Seattle Fire Department spokesman Kyle Moore, five people who were on-board the train at the time of the crash, including a six-year-old boy, were hospitalized at Harborview Medical Center to receive medical treatment. The van also sustained significant physical damage – as can be seen in the image above – and news reports indicated that the collision destroyed a pedestrian traffic signal. It is unclear who exactly was driving the van at the time or what caused them to make the illegal turn, which also had to be towed away from the scene. But if witnesses’ accounts of the incident are accurate, it appears that the driver of the van could potentially be held liable for the crash. Personal injury claims involving large corporations or entities, including mass transit companies such as Sound Transit, are often much more complex and difficult to pursue for those with a limited understanding of the legal process. Visit the Davis Law Group library to learn more about your legal rights after an accident.